The club runs several fundraising events throughout the year to help keep fees and membership to a reasonable level. The income from monthly training fees doesn’t fully cover the cost of pool hire, coaching and lifeguards. We depend on other income from other sources, but predominately fundraising. Please help your club by getting involved. Don’t just rely on someone else doing this, it tends to be the same people who get involved every time. Your club needs you! Get involved where you can by donating time or money, and get your wider community involved as well. The lottery is a vital fundraiser for the club to help pay for basic pool time which the monthly fees don’t cover. We desperately need more people to take part each month, it’s easy to do and it helps support the club for all our kids. The draw is made monthly with each ticket costing £5. Three cash prizes are awarded each month – 1st prize of 25% of the monthly pot; 2nd prize of 15%; 3rd prize of 10%. You can purchase more than 1 draw number and friends, family, colleagues and neighbours can all take part as long as they’re over 18. Witnessed prize draws will be held each month by the 20th of the month, winners are notified by email. To get started, email lottery@swimhearts.com, indicating how many draw numbers you wish to be allocated. We try to get one bag packing slot at a supermarket per year. Recently though it’s become very difficult to get one. When we can get one they are a very easy and good source of income. This can range from £500 to the massive £1300 made at Tesco Colinton on 23rd December 2017. We only ask swimmers and parents to donate at least one hour of their time, which isn’t much to ask. It’s great fun, the kids enjoy it and we’ve never had a bad experience. Please get involved when asked, all levels of the club should take part. 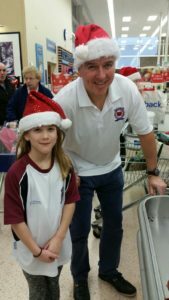 On Sunday 23rd December 2018, 50 swimmers and their festively dressed siblings and parents, volunteered to bag pack at Morrisons in the Gyle. They raised a whopping £1300.50 for the club. Many thanks to all who took part!! 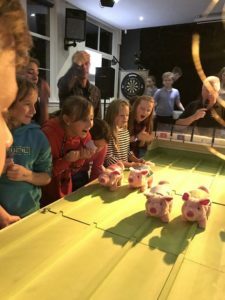 We run a fun pig racing night every September, which as well as being a fundraiser is an opportunity to socialise for the swimmers and parents. Get family, colleagues and friends involved by “selling” them a pig or two. If their pig wins they will get a cash prize. Invite them to the race night and they’ll be able to cheer it on in person. On Saturday 1st September 2018, the Pig Racing Night was very well attended with over 80 swimmers and adults joining in the fun which raised £694! 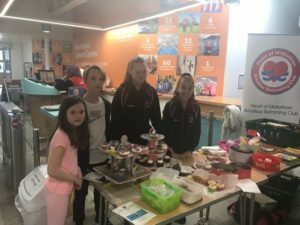 We run a tombola and raffle stall at all our own meets – Premier age group, Novice, and SNAGS Last Chance. We’re always looking for a variety of items, look out for emails. As well as running a bake stall at our own club champs we now try to run 2 throughout the year at either Drumbrae or RCP.